Hillary Clinton supporters received a special campaign email on Monday. Penned by actor George Clooney, the letter offers his and wife Amal's support for the former Secretary of State while also announcing a contest to meet the candidate and celebrities at Clooney's Los Angeles home on April 16. What immediately stood out was what the actor had to say about another presidential hopeful, however. George Clooney's anti-Donald Trump letter doesn't necessarily name the real estate magnate but it certainly appears as if he's calling out the Donald. He’s just an opportunist. Now he’s a fascist; a xenophobic fascist... You know, the truth of the matter is, in election season, things go crazy, and the loudest voices are the furthest and most extreme. So you hear a massively stupid idea, like we’re going to ban Muslims from the country. Now, we’re not ever going to do that. Once again, Clooney spoke out about the "loudest voice" in the election season with his Clinton campaign email. The fundraising dinner that Clooney is putting on for Clinton in April could very well raise an impressive amount of money for the candidate. Tickets are reportedly priced at $33,400 per person, according to Variety. All proceeds will benefit the Hillary Victory Fund, a joint initiative between the candidate's campaign and the DNC that was made possible by the loosening of campaign finance rules during this election season. Clooney's event will reportedly feature rock group Haim as well as director Steven Spielberg, among many other celebrities. If you listen to the loudest voices out there today, you’d think we’re a country that hates Mexicans, hates Muslims, and thinks that committing war crimes is the best way to make America great again. ... As this primary process continues, Hillary could soon have an insurmountable delegate lead and with that, the Democratic nomination. That would then make her the only grown-up in the room. And if ever there was a time for a grown-up, that time is now. The Hollywood superstar has been a longtime Democratic presidential supporter and hosted a similarly high profile event to benefit President Obama's campaign in 2012. He certainly doesn't seem to be changing his affiliation anytime soon. 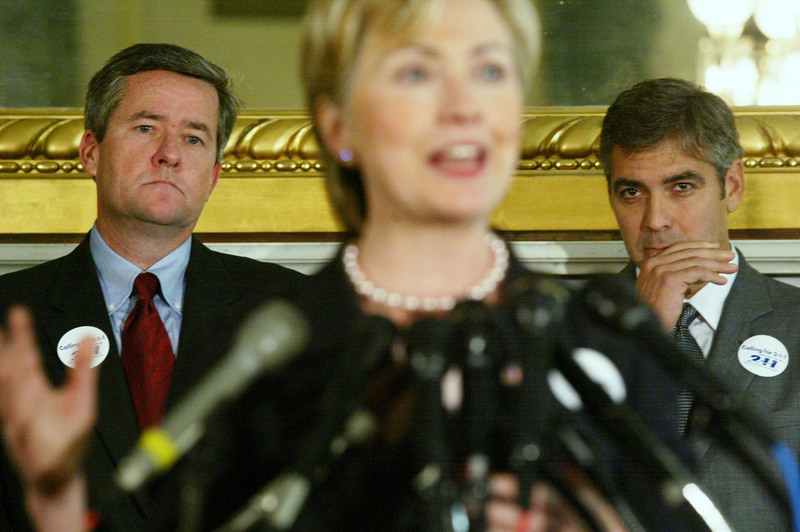 If one thing is clear about Clooney's letter, it's that he'd rather "make America whole again" a la Clinton rather than back the Trump campaign.